Papa HYGINUS Hygínos c. 74 Athens, Achaea, Roman Empire[birth 1] 58 / 62 Greek. Tradition holds he was martyred; feast day 11 January. Interregnum Almost three-year period without a valid pope elected. This was due to a deadlock among cardinals voting for the pope. Interregnum Two-year period without a valid pope elected. This was due to a deadlock among cardinals voting for the pope. Interregnum Two-year period without a valid pope elected. Council of Constance collectively exercised Papal power until all popes were dead. Interregnum Six-month period without a valid pope elected. This was due to unique logistical problems (the old pope died a prisoner and the conclave was in Venice) and a deadlock among cardinals voting. Paschal Robinson (1913). "Antipope" . In Herbermann, Charles (ed.). Catholic Encyclopedia. New York: Robert Appleton Company. Paschal Robinson (1913). 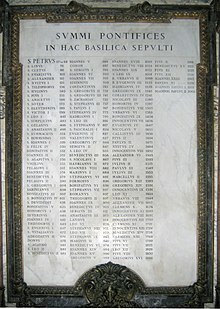 "Chronological Lists of Popes" . In Herbermann, Charles (ed.). Catholic Encyclopedia. New York: Robert Appleton Company. Paschal Robinson (1913). "Pope Martin IV" . In Herbermann, Charles (ed.). Catholic Encyclopedia. New York: Robert Appleton Company. Paschal Robinson (1913). "Popess Joan" . In Herbermann, Charles (ed.). Catholic Encyclopedia. New York: Robert Appleton Company.